Children’s bike takes a very different meaning in Japanese than in English, is your website saying what you want it to? This article is meant to help you select a Japanese translation service that will become an effective part of your Japanese localization strategy. Translation is often the first hurdle for companies looking to expand their web presence across international borders. Unfortunately, there are a lot of lasting problems that can come from choosing the wrong translation service. There’s also a lot more to localization than just a translation of your existing website. We hope this advice helps you avoid those mistakes when you enter the Japanese market, or any foreign markets for that matter. You should properly vet your Japanese translator before hiring them to make sure they have the skills you need. There are different kinds of translation services for different purposes. The following questions will help you find a translation service provider that has the skills to translate and sell your products with their copy on your website. 1. do you have experience with marketing translation & keyword implementation? Hiring a translator that is good at translating but not good at marketing is a common problem that we see on the web. Of course, hiring an accurate Japanese translator is critical, but the translation itself should also be good at selling your product. That is a skill that a marketing copywriter has. Your copywriter might not be the same person that translates your copy. Be sure to ask the translator/translation service how they plan to handle sales and marketing copy in Japanese. SEO and keyword splicing is another part of the translation question that can be easily overlooked. As search engines become smarter and smarter at analyzing and categorizing content, keyword splicing is becoming less and less important in today’s world. However, using keywords in your copy in a natural and organic way is still what will clarify your content and educate those search engines. You should feel confident that your Japanese translator can implement keywords effectively in your copy without shoehorning them in awkwardly. Humble Bunny offers these translation services as well. Please take a look at our Japanese SEO services to learn more about how we can help your website translation. 2. Do You Know My Industry? Another issue is finding someone who can effectively talk about your product. It’s important to remember that even if someone is a native speaker, they may not have the vocabulary required to write about your product. The more technical your product or service is, the more critical this becomes. We understand that for some industries it could be very difficult to find a translator with the expert knowledge that you require. If that is the case, we suggest looking internally if possible. Get your bilingual experts to write copy as directly and simply as they can. You can then take this to a marketing copywriter who can adapt it to sound better and more appealing to readers. Another option is to use technical copy for product descriptions, and hire a translator or copywriter for your marketing and sales copy. This will take a bit more work to organize and execute properly, but the result will make your site much more appealing to readers. Having a good copywriter as a translator can make a huge impact on the conversion rates (lead generation, sales, etc…) of your website. The best way to choose which Japanese translation service to use is to check their portfolio. Of course, if you can’t read the copy in the target language, there are other metrics you could ask for to get an insight on their skills. See if they have analytics data on the websites that they have translated. Stats such as click-through rates and conversion rates for leads are great indicators especially if there’s a set of before and after data to show improvement. It’s also useful to have your staff (someone that speaks the target language) read through the translation services’ portfolio to see how it reads. There are many poor translations out there, maybe you’ve seen some strange ones from Japanese companies in English. To make matter worse, Japanese consumers have a high level of skepticism towards foreign brands and goods compared to other countries. Having unnatural copy is a quick way to lose trust before you even begin to communicate with Japanese consumers. Below are some common mistakes we see from English to Japanese translations on the web. The way we say things in Japanese and English can be very different sometimes. Translations that are too direct will likely overlook these differences. From English to Japanese, the culture difference dictates a lot of how people talk and how communications are built. It’s best to give the translator flexibility to adapt the copy to Japanese norms, rather than strive for a strict and close translation. Japan is a “high-context” society, while many western countries are “low-context”. What that means is that western communications tend to be very direct and to the point, while Japanese communications are more indirect. Japanese audiences can pick up on nuance and context more adeptly with properly written Japanese and will generally pick up on that. If your copy is too direct, it will sound aggressive and pushy to Japanese audiences. It’s best to give the translator flexibility to adapt the copy to Japanese norms, rather than strive for a strict and close translation. In some situations, it may even make sense to remove certain original thoughts altogether. An obvious extension to all of the above: if your website layout and media strategy (i.e. photo/video choice) is built around direct, low-context (i.e non-Japanese) communications it should be adjusted to accommodate Japanese web design tastes. Another issue that is very unique to Japanese is the use of loan words. Japanese has a special alphabet, Katakana, which is mostly used for foreign words that have been adopted into the language. It’s often baffling how many phrases have landed into the Japanese lexicon. Oddly, a lot of them have very different nuances in Japanese than they do in their native language. For example “baiku”, or “bike”, in Japanese is exclusively used for motorcycles. Never does the term “baiku” mean a bicycle as “bike” could in English. Another one is “aircon”, which is used to describe a heating and air conditioning machine found in most Japanese homes. In English “aircon” would only mean air conditioning, and not a heater. (Just so you know “sutoobu,” “stove,” is the word for heater and “kuuraa,” “cooler,” is the word for air conditioner) These seem like small details but they could easily get lost in translation with your copy if its meaning isn’t understood clearly by your translator. We certainly don’t discourage the use of katakana words on your website. We think they can actually help your brand if you’re using the foreign aspect of your brand as a benefit. It is very important to be aware of these differences though, as they can completely change the meaning of your copy in some instances. Be sure to confirm that your translator completely understands the meaning of your original text to avoid this common mistake. Don't make your readers feel like they're speaking to a robot on your site. This should be a given but we have seen it out in the wild from brands who we thought knew better. Technology is getting good but it’s still no substitute for a native speaker of your target language. There are also some technical reasons that you shouldn’t do this, which will affect the overall traffic on your website. We’ve mentioned the importance of organizing multilingual sites for SEO in previous articles, and this also applies to the translations themselves. Google states that automated translations are often unnatural and could be viewed as spam by their website crawlers. If Google determines that your website is spam, your site will not appear in relevant Google search results. Automatic translators that translate websites live on the page are also frowned upon by Google. Be sure your copy is as natural as possible, and your website is organized properly for multilingual SEO in Japanese. Check out our totally human translation and SEO Services to learn more about how they can help your website rank better in search results. Taco Bell showed an odd case of this when they launched a new Japanese website in 2015. “Crunchwrap Supreme” became “Supreme Court Beef,” The real doozy was when “Cheesy Potatoes” somehow got translated to “Cheap Potatoes”. We’re pretty sure their site was translated using machine translation services such as Google Translate. Mix-ups like this are highly embarrassing and show that you’re not truly committed to the Japanese market. Additionally they can turn something as delicious as a Crunchwrap Supreme into something totally unappetizing. 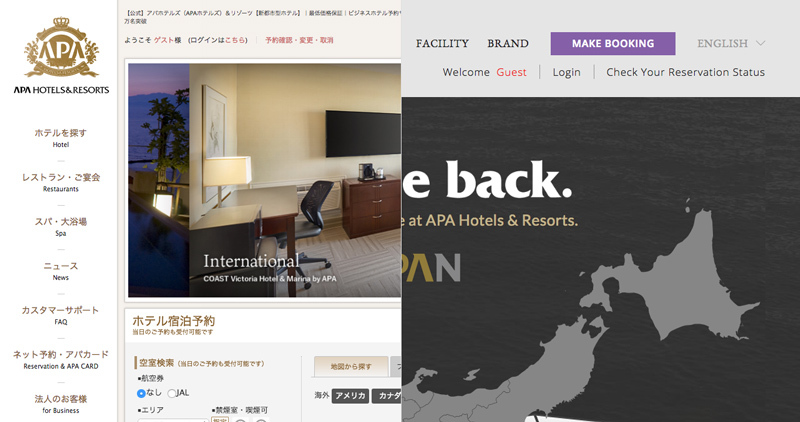 The APA Hotels English and Japanese homepages have totally different layouts in addition to translations. Translation is just one of many parts of localizing your website for Japanese audiences. Your site also needs to be adjusted visually and your copy should be voiced naturally. Simply translating a website that was meant for western audiences will leave you with a web presence that looks empty and unfinished, rather than exciting and appealing. If you’d like to learn more about Japanese translation services, we’d be glad to help you plan your localization strategy properly.